Learning to type, that is touch typing, is an important skill in our family. In this technological age that our children live in it is imperative our children are conversant with computer skills. We begin our typing lessons after the child can read (or simultaneously once the child has an understanding/recognition of letters). We use Nodtronics “Touch Typing”, which here in Australia you can pick up for $10.00 at either Woollies or Australia Post. Since this has been so successful with my children I can’t see the benefits in spending $60+ on a brand name typing-tutor-CD. When the children start their lessons we have a discussion on how we learn to type; it isn’t a subject where you sit down and work through lesson 1 to 60. Typing is pure practice, practice, practice; drill, drill, drill. The programme I use, and would recommend the same type of alternatives, is simple repetitive exercises, without the fluff of it being a game (that is my personal preference). I let them know that sitting upright, and not looking at the keys is very important. Though the children work independently with the CD tutor I do check on these things regularly. We discuss that their self-discipline in this area will ensure that they can continue with this course. If I have to correct them too often then we delay their typing lessons. They need to have their chair squarely in front of the keyboard and screen at a height where their elbows are close to vertical with their wrists, with their feet flat on the floor or a box. 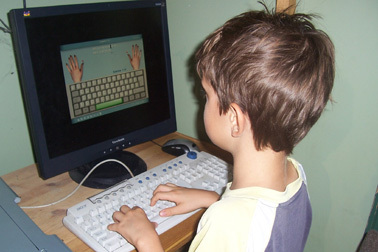 Their fingers need to be high (not flat) on the keyboard with their wrists not touching anything. They don’t use the computer for writing tasks until they have completed the keyboard drills. When they get to the level of word exercises in the lessons they can use the keyboard for writing. Speed comes after you have mastered the finger positions. Once the lessons have been completed, with the focus on finger positions and correct keystrokes, then we redo the course with speed as the focus. Side note: I know this is not how I learnt (I learnt position and speed together) but I have found breaking down your focus helps the children succeed quicker. The whole process may take the same length of time, but the children feel successful earlier on. For some, typing may take a whole year to learn – no rushing, just daily practice. Because typing is both a priority and a skill that needs repetitive practice it is a part of the children’s Discipline Studies and it gets scheduled into our regular study days. Many mums delay typing lessons because they know they are not that proficient at it themselves - all the more reason to encourage our children in this skill that is so necessary in this day and age. All the better if Mum starts typing practice herself!